Notes.... seems like half my life during law school is spent taking notes. Reading notes, class notes, notes on how to outline, notes of how to study, notes on internship searching.... it never ends. One of the pros to this-I have gotten extremely good at my notetaking system. I have always been an avid note taker. From high school to undergrad, I never went through a class without taking notes. Generally, I have always preferred to take handwritten notes given that it has been scientifically proven that handwriting helps information retention. 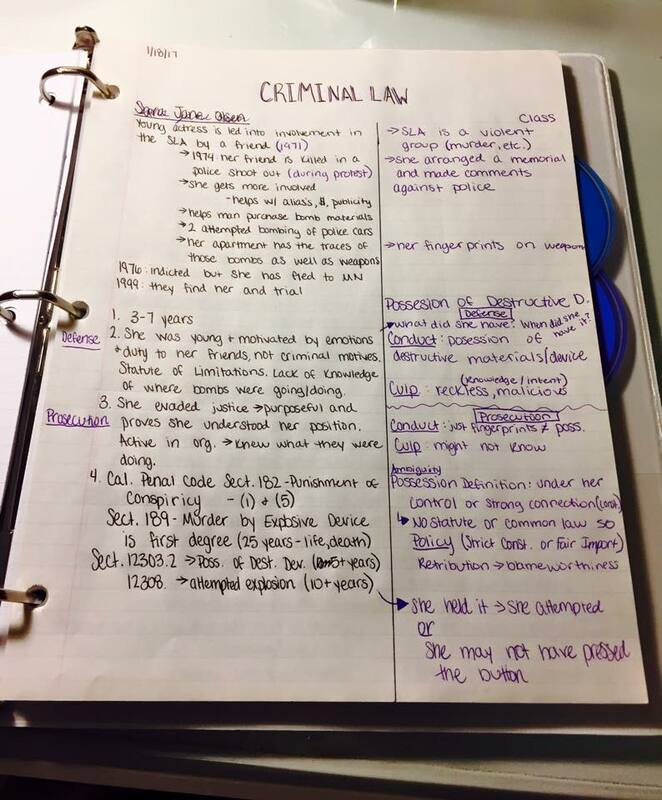 Once I started law school, I knew my notetaking was going to need an overhaul. After 1 complete semester and a good way through the second one, here is what I have learned as the best notetaking strategies for law school. As I have spent more time in law school, I have slowly become more used to taking computer notes. Thankfully I have a nice light laptop that is easy to carry to and from class. Here are my Pros and Cons to taking notes on the computer. Some professors go so fast through such volumes of information, it is the only way I can keep up. Other times, I am taking notes through a worksheet the professor emailed out and it is just easier to fill in on the computer. 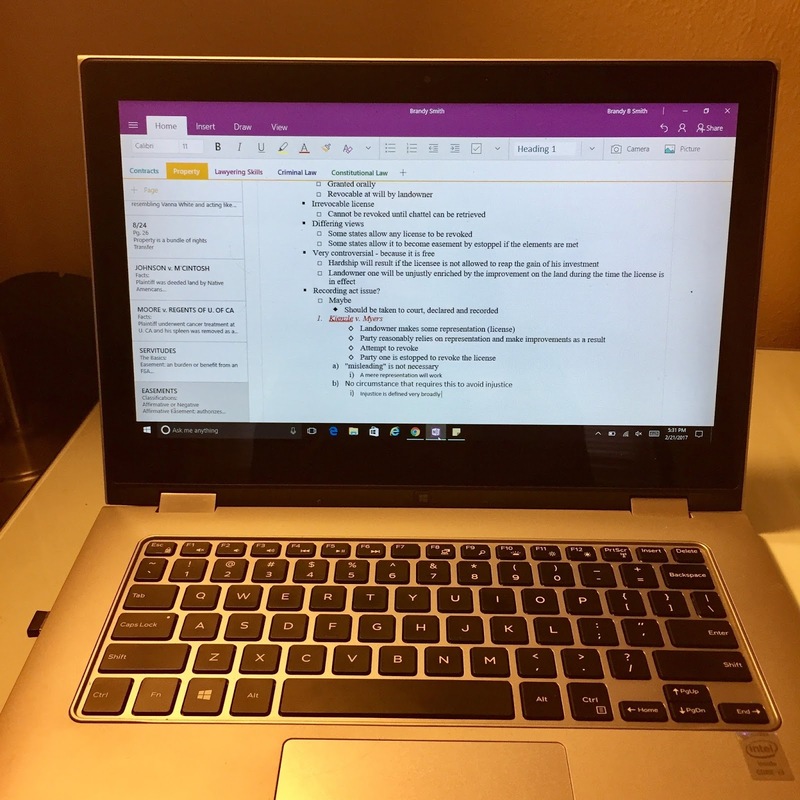 Computer notes are clean and organized and you adjust the placement of information and have more flexibility. It is easy to get distracted on the internet. Typing notes does not promote the same level of retention. Typed notes are harder to review after the fact. As for myself, I take computer notes in two classes: one because the professor goes too fast for me to be able to handwrite and the other because I fill in an outline that the professor emails to use before each class. I also tend to take reading notes on my computer and print them out to fill in with class notes. My sole reason for doing this is because I am OCD and I prefer a nice organized sheet of notes. 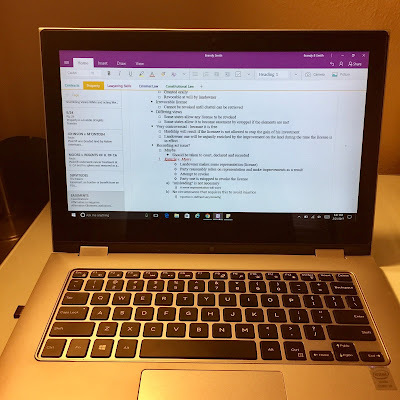 When I take notes on my computer, I use Microsoft OneNote. This program is great because I can make multiple folders for each of my classes and within the folder, multiple tabbed sheets for each different day/topic in class. This program saves continuously so I never worry about losing my work and syncs continuously between my computer, my iPad and my phone so I have everything I need no matter where I am. It has many text options and you can even draw within it if you need to diagram. It is the bomb.com. One thing I do not like about taking computer notes is how easy it is for me to become distracted by emails and facebook. I try really hard to not, but sometimes it happens. You have to have a lot of self-control when taking computer notes. Another thing that I don't like about computer notes is when it comes time to review- I have to print them out because I just can't read on the computer screen (it gives me a headache). All pros and cons aside, computer notes are definitely a large way I take notes during law school and something I do suggest for law students in general. I take handwritten notes in 3 of my classes. One class is a no-laptop policy professor so I do not have a choice but in the others, it is all my idea. I like to do my handwritten notes on a nice, thick, reinforced loose leaf paper so I can add reading notes into class notes and add a page if I need to fill in. I think loose leaf paper in a binder provides more flexibility than a notebook. I use a variety of pens in a wide variety of colors. These Pilot G-2's are my favorites (SO smooth), closely followed by these Papermate InkJoy's (don't bleed!!) and I also love a good Sharpie Pen. I also keep sticky notes, tabs, a whiteout EZ corrector and highlighters in my pencil bag to keep my handwritten notes organized and in tip top shape. Personally, I like handwriting my notes when possible. I think it does help with retention and I love to color code the crap out of my notes. It can be frustrating when you write something and then later the professor adds on to it but you have nowhere to put that (hence why I carry sticky notes). Overall, in y tougher classes, I tend to gravitate toward handwriting my notes for utmost retention. You never want to count out handwriting as an option because many professors do not allow laptops and you will have to handwrite. It is just one of those skills that never goes away. Law school has certainly changed my note taking skills beyond just handwritten v. computer. I have learned to case brief, IRAC, incorporate reading and class notes, outline and book brief. Some people write out full case briefs for every case they read. This involves something you will later become very familiar with: IRAC- Issue, Rule of Law, Analysis and Conclusion. When taking exams, IRAC is the suggested structure for your answers. A great way to get into that habit is by briefing each case in that style. I do not write out a brief for each case, but I do book brief; that means I highlight in my book with a different color for each part. This way in class, I just look for pink to find the facts, green for the rule of law and blue for the holding/conclusion. 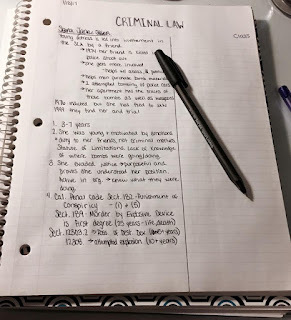 However, I have been writing out full case briefs for my Constitutional law class because the cases are so heavy and I want to improve my issue statements for spring exams. Everyone is different- I know lots of people who brief every case and lots of people who book brief. Not everyone takes reading notes but they really are helpful. My tactic this semester has been to take reading notes either handwritten or on the computer on half a page. I leave sufficient space to fill in with class lecture notes. By doing it this way, all my notes, reading and lecture, are together in the same spot, instead of having reading notes and then the same topic from class several pages later. I find this system to work very well because I can see exactly what I am missing in my reading compared to what they go over in class. Come outlining time, everything is organized and ready to go. I also print any class powerpoints and place them with the notes for that day/topic. All of this goes into a binder with tabs for each new topic. Trust me- an organized binder makes for a much easier time when outlining. I make flashcards as we go along of rule statements, definitions, element lists and pretty much anything that requires memorization. I keep everything in a big flashcard box and take it everywhere. That way, I can flip through them and work on my memorization whenever I have a spare minute. I find that writing out the flashcards alone is great for retention. Just the act of writing out the words puts it into your brain one more time and reaffirms the concept. Speaking of outlining, it is an integral part of law school success. Because it is so important, I am going to devote a whole post to it later. Check back soon! So there you go- pretty much all the nuances of my note taking system for law school. 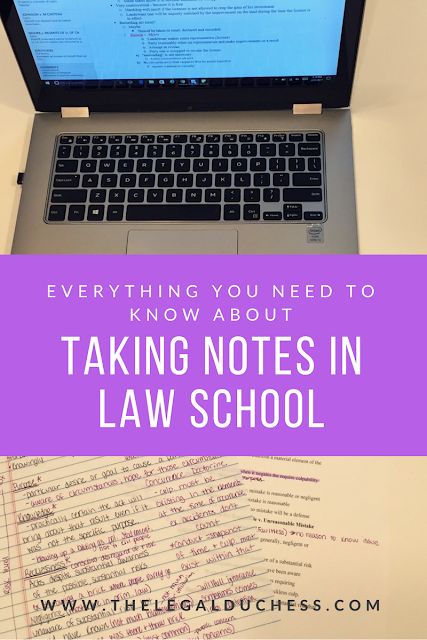 From handwriting notes, to OneNote, reading notes and outlines, law school is simply chock full of note taking. My best advice is to find a system that works for YOU and YOU alone- do not try to do what everyone else does just because you think that is the "right" way. There is no right and wrong way, there is just your own system and what works best for your learning. This was a very helpful post! My first day back at law school is tomorrow and I'm trying a new style of note taking! I love this!! Thank you so much for posting! This was very helpful, will be using much of this for my 1L starting next month. Loved this post Brandy! It really was helpful. Home investigation courses were presently however much better professional website for students than anyone might have expected and individuals began spreading the great word. I teach postgraduate law students in the UK. This post is excellent. Very helpful and practical.